Windows 10 starts as a very annoying operating system. The Start menu is full of games like Candy Crush, advertisements are all over the place, and useless icons like People litter the taskbar. Here’s how to eliminate all those annoyances. Out of the box, your PC includes apps you probably don’t want. Every Windows 10 install starts with a Candy Crush game like Candy Crush Soda Saga. You’ll also see other annoying apps like Bubble Witch 3 Saga and FarmVille 2: Country Escape. Thanks, Microsoft. 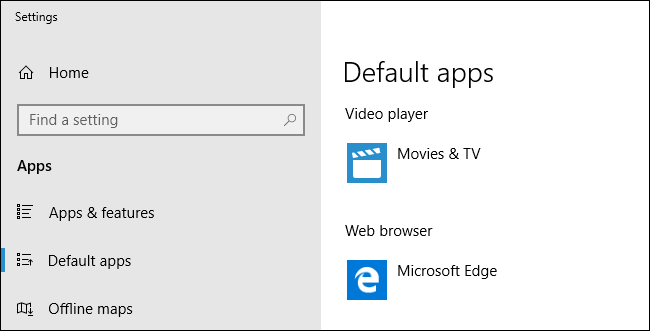 Just open your Start menu and scroll through the application list to see what’s installed. To uninstall an app you don’t want, right-click it and select the “Uninstall” command. The app will vanish until the next time you set up a new PC. Unfortunately, there’s no way to prevent Windows 10 from installing these apps without asking you. While Microsoft is guilty of forcing Candy Crush on Windows users, PC manufacturers often install useless “bloatware” that can even slow your PC down while it runs in the background. To get rid of this unnecessary software, head to Control Panel > Uninstall a Program or Settings > Apps > Apps & Features. Uninstall any manufacturer-provided applications you don’t want on your system. Some applications may be hardware utilities that perform useful functions, but you probably don’t need most of them. If your system is completely packed with junk software, consider using Windows 10’s “Fresh Start” tool to get a fresh Windows operating system. 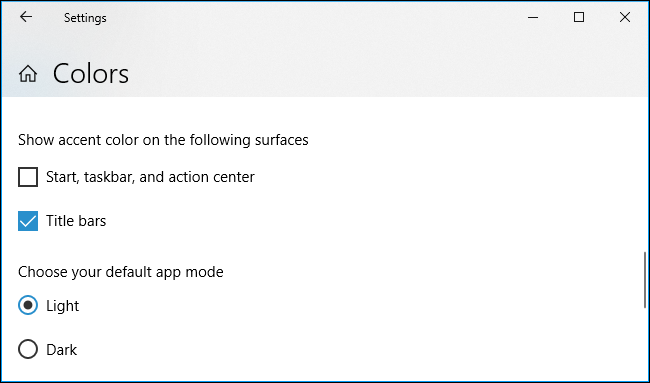 To find it, open the “Windows Defender Security Center” application from your Start menu, and then click “Device Performance & Health” in the sidebar. Click “Additional Info” under Fresh Start and click the “Get Started” button to continue. Windows 10 is packed with built-in advertisements. You’ll see ads on your lock screen, suggested apps in your Start menu, taskbar pop-ups encouraging you to use Microsoft Edge, and notifications asking you to check out Office 365. Cortana occasionally bounces up and down on your taskbar with messages for you, the Solitaire game includes 30-second video ads, and even File Explorer recommends you use OneDrive. That isn’t even a complete list of all the ads we’ve found. Microsoft scattered the options for disabling these advertisements all over the operating system. Follow our guide to disabling all of Windows 10’s built-in advertising to hunt them all down. Windows 10’s taskbar starts pretty cluttered. By default, you’ll see a Cortana search box, Task View shortcut, People icon, and possibly Ink Workspace and touch keyboard buttons. Shortcuts to apps you may not use frequently, like the Microsoft Store and Windows’ Mail app, are also pinned to the taskbar. 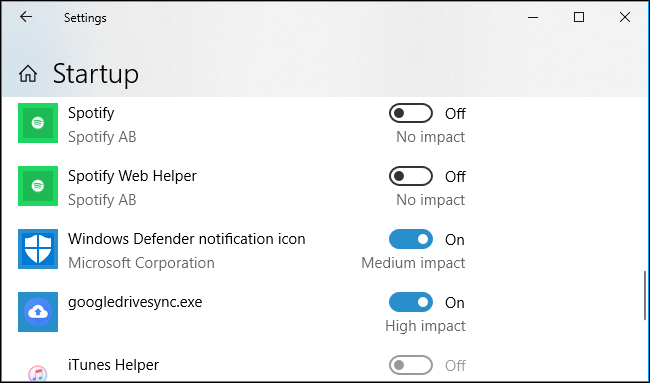 To remove useless icons from your taskbar, just right-click them and use the options in the context menu. Select Cortana > Hidden to hide the Cortana shortcut. 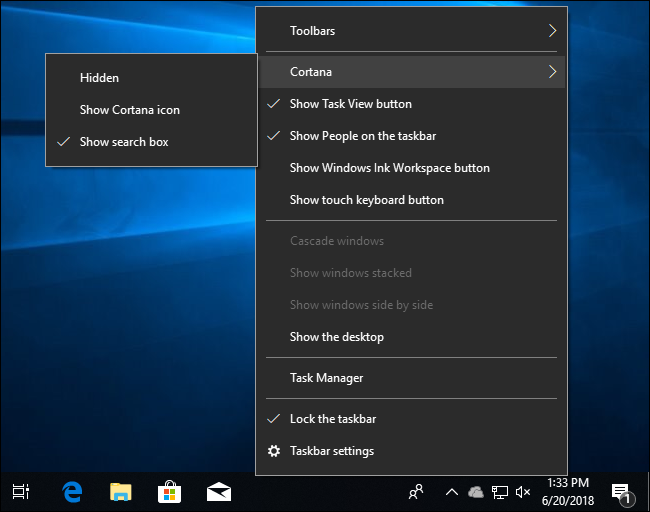 Uncheck the “Show Task View Button,” “Show People on the Taskbar,” “Show Windows Ink Workspace Button,” and “Show Touch Keyboard Button” to hide everything else. Even after hiding Cortana from the taskbar, you can still search with Cortana by opening your Start menu and typing. You can also still view the Task View interface by pressing Windows+Tab. To unpin other shortcuts from your taskbar, like the Microsoft Store and Microsoft Edge, right-click them and select the “Unpin From Taskbar” command. Microsoft’s OneDrive cloud file storage service is noisy, too. If you haven’t set OneDrive up, you’ll see a pop-up asking you to do so every time you sign in to your PC. 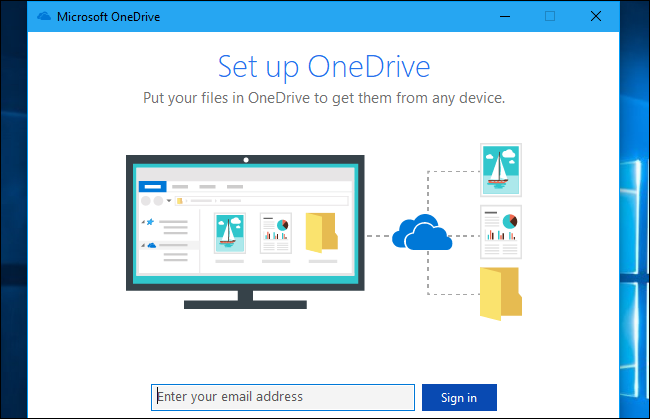 If you don’t want to use OneDrive, you can either stop OneDrive from launching at boot or uninstall it. A OneDrive shortcut still appears in File Explorer’s sidebar after you uninstall it, but you can remove that by editing your Registry. Windows 10’s Start menu is filled with animated live tiles for apps you may not use. Every time you open your Start menu, you’ll see news, weather, new apps in the Microsoft Store, and more. To make your Start menu less annoying, we recommend unpinning apps you never use and don’t care about. 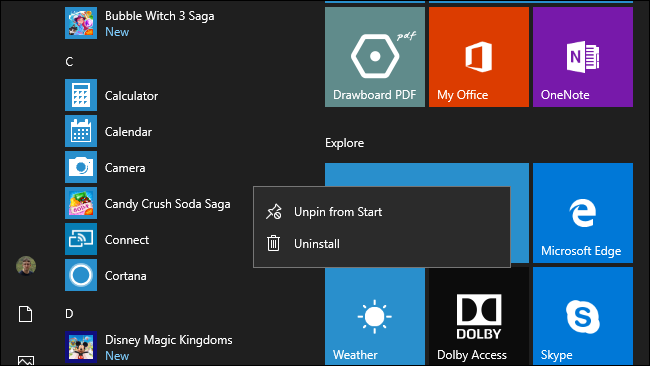 Just open your Start menu, right-click them, and select “Unpin from Start” to hide them. If you want a shortcut here but don’t want the live tile, select More > Turn Live Tile Off instead. After you’re done, pin apps you do use to your Start menu. Just right-click them in the apps list, and then select the “Pin to Start” command. Once they’re pinned, you can then move them around by dragging and dropping. You can make these tiles larger or smaller by right-clicking them and selecting Resize, too. You can even resize your start menu to make it larger or smaller—just position your mouse over one of the edges (or the top right corner) and click and drag the start menu to enlarge or shrink it. Statistically speaking, you probably don’t want to use Microsoft’s Bing search engine and the Edge web browser. You probably want to use Google and the Google Chrome web browser. To make Chrome your default browser, install it, and then head to Settings > Apps > Default Apps. Click the “Web Browser” option here, and then select the “Google Chrome” option. You can then pin Google Chrome to your taskbar by right-clicking its taskbar icon when it’s open, and then selecting the “Pin to Taskbar” command. To use Google as your default search engine in Microsoft Edge, first visit Google.com in Edge. Next, click menu > Settings > View Advanced Settings > Change Search Engine, and then set Google as your default. Cortana will still continue to search with Bing in Edge by default, even if your default search engine is Google and your default browser is Chrome. You can install the EdgeDeflector tool to force Cortana to search with Google—or just not use Cortana for web searches. 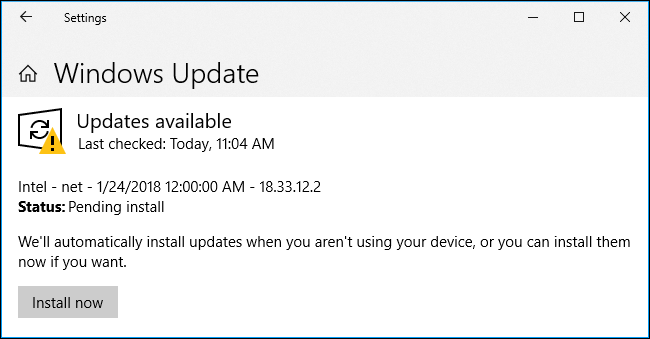 Windows 10 automatically installs updates when they’re available, and there’s no way to fully disable these automatic updates. However, you can set your network connection as “metered”—whether it’s a Wi-Fi connection or a wired Ethernet connection. On metered connections, Windows 10 will ask you for permission before downloading updates. You can set a Wi-Fi connection as metered by heading to Settings > Network & Internet > Wi-Fi, clicking the wireless network’s name, and then toggling the switch under “Set as metered connection” to the “On” position. For wired network connections, head to Settings > Network & Internet > Ethernet and click the wired network connection’s name instead. You can also tell Windows not to install updates during certain hours. To do so, head to Settings > Update & Security > Windows Update > Change Active Hours. You can set up to 18 hours of the day when you’re normally active. Windows will automatically install updates (and reboot your PC, if necessary) only during the hours you don’t set as active hours. Windows Update automatically uploads copies of the updates you download to other PCs over the Internet. This can potentially slow down your connection, and it will waste your limited bandwidth if your internet service provider imposes a bandwidth cap on you, as many now do. All so Microsoft can save money on its bandwidth bills. 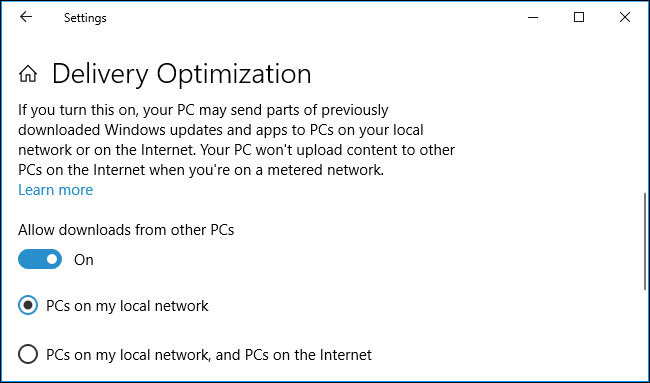 To stop Windows 10 from uploading updates, head to Settings > Update & Security > Windows Update > Advanced Options > Delivery Optimization, and then set the “Allow downloads from other PCs” option to “PCs on my local network.” Your PCs will still share updates with each other over your local network, which will save you some download bandwidth. The standard window title bars in Windows 10 are white, which can get boring fast. To enable colored title bars, head to Settings > Personalization > Colors. Enable the “Title bars” option under “Show accent color on the following surfaces” here. You can also select any accent color you like from here. By default, Windows will automatically select one that matches your desktop background. Note: If you use a Microsoft account to sign into multiple Windows 10 PCs, Windows syncs many of your personalization settings by default. So, for example, if you turn title bar colors on or off on one PC, that setting will get synced to your other PCs. 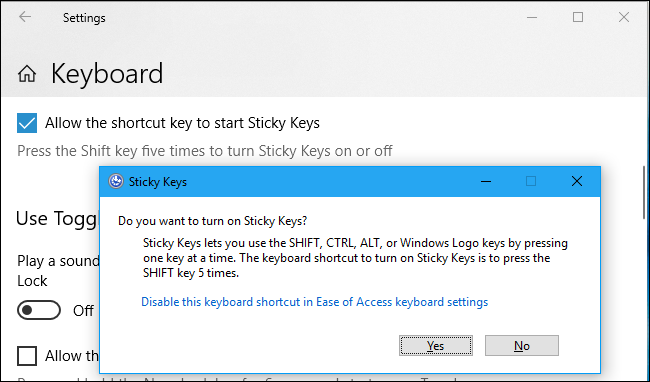 The Sticky Keys shortcut has been annoying Windows users for decades. It pops up and asks you if you want to enable the Sticky Keys accessibility feature if you press the Shift key five times quickly, and it’s very easy to accidentally do this while playing PC games. To stop this from happening, head to Settings > Ease of Access > Keyboard. Uncheck the “Allow the shortcut to start Sticky Keys” option under the “Use Sticky Keys” section. You may also want to disable the Toggle Keys and Filter Keys shortcuts while you’re there. Note: If you use a Microsoft account to sign into multiple Windows 10 PCs, Windows syncs your Ease of Access settings (and many other settings) by default. So, for example, if you turn the Sticky Keys shortcut on or off on one PC, that setting will get synced to your other PCs. Sure, Windows 10’s lock screen is pretty. The lock screen shows a nice-looking background image, and you can have Windows apps display information like the weather and any new emails you have on it. All of this can be configured from Settings > Personalization > Lock Screen. However, for many people, the lock screen is useless and just something to swipe away before you sign in. If you never want to see the lock screen, you can disable the lock screen via the Registry and have Windows go straight to the sign-in screen when it boots or resumes from sleep. For some reason, Microsoft still configures Windows 10 to hide file extensions by default. This is especially bad for security—it’s helpful to know whether that file is a document or a program before you double-click it. To make Windows show file extensions, open File Explorer, click the “View” tab on the ribbon at the top of the window, and check “File name extensions” in the Show/hide section. On any device, notifications can be useful—but they can also be very distracting. 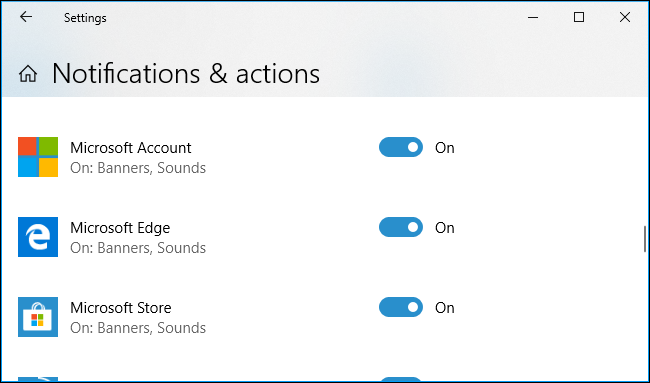 Windows 10 offers a one-click switch that disables all notifications, and you can also disable notifications for individual applications to prevent them from annoying you. This will affect every single application that uses standard Windows desktop notifications, including traditional Windows desktop applications. However, some applications use their own custom notification pop-ups, so you can’t disable their notifications form here. For those, you’ll have to dig into the app’s settings. Startup programs can quickly get annoying on Windows. They make your PC take longer to boot, and they can also waste CPU and memory while running in the background. Even if your PC boots fast and runs well, startup programs can quickly clutter your notification area. To prevent programs from launching at boot, head to Settings > Apps > Startup. Toggle applications to “Off” to prevent them from automatically starting. Be careful what you disable, though—for example, if you use Dropbox and stop Dropbox from automatically launching at boot, Dropbox won’t start syncing your files until you launch it manually. You can also head to Task Manager > Startup to find these same settings. Is it just us, or is that 3D Objects folder in File Explorer really annoying? How many Windows users actually work with 3D objects enough to need this folder? We know Microsoft is trying to push Paint 3D, but come on. You’ll need to edit the Registry to disable the 3D Objects folder. You can also remove the other special folders from This PC, if you like. Windows automatically sends some telemetry data to Microsoft, but you can limit what’s sent. To do so, head to Settings > Privacy > Diagnostics & Feedback and select the “Basic” level instead of the “Full” level. Your PC will still work normally, but it will send less data to Microsoft. 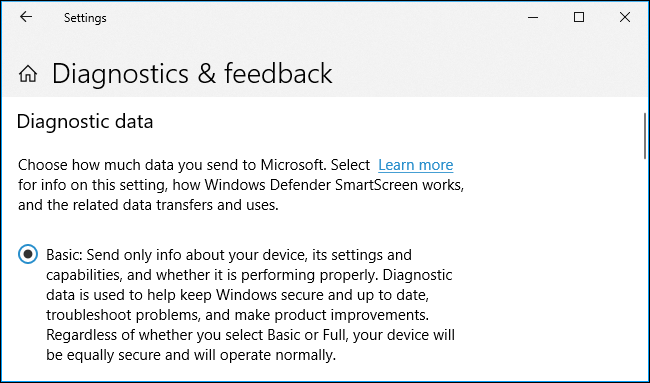 RELATED: What Do Windows 10’s Basic and Full Telemetry Settings Actually Do? We think most people will be happier with a Microsoft account, but you can switch to a local user account if you prefer that. And, if you’re the only person who uses your PC and it’s located in a secure area, you can set up automatic login to eliminate the annoyance of typing your password on every boot. We don’t recommend disabling User Account Control—it may be annoying, particularly when setting up a new PC, but it’s a useful security feature. Microsoft will keep adding more annoying features to future patches of Windows 10, we’re sure of it. This will be a constant battle.